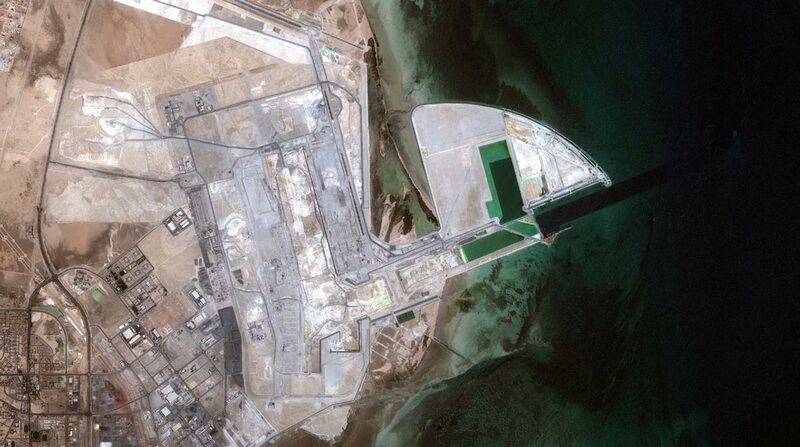 The New Port Project (NPP) in the State of Qatar is one of the world’s most ambitious Greenfield port developments. A true megaproject, the four-year NPP involves construction of a shipping port in the Persian Gulf where no marine facility or harbor existed before. Excavating millions of cubic meters of materials both onshore and off had to be monitored continuously to keep the project on schedule and preserve the surrounding ecosystem. largest cargo ships in the world. Construction has required the coordinated activities of thousands of workers, earth-moving vehicles and dredging vessels. Their jobs have focused on removing materials from specific locations in the desert and Persian Gulf and depositing them in exact spots elsewhere. Complicating these tasks is the presence of fragile coral, sea grass and mangrove habitats. MEDCO, a joint venture between a Belgian dredging company and a Qatar construction firm, needed to ensure the on- and offshore earth-moving activities were being conducted throughout the sprawling project area with precision according to carefully designed engineering plans. Disincentives made damaging the local ecosystem a hazard to be avoided. Monitoring the site by air was out of the question due to restrictions on private aircraft in Qatar. MEDCO contracted GeoID to provide monthly high-resolution, natural-color satellite image mosaics of the entire project area and its surroundings – 500 km² – extending far inland and out to sea. 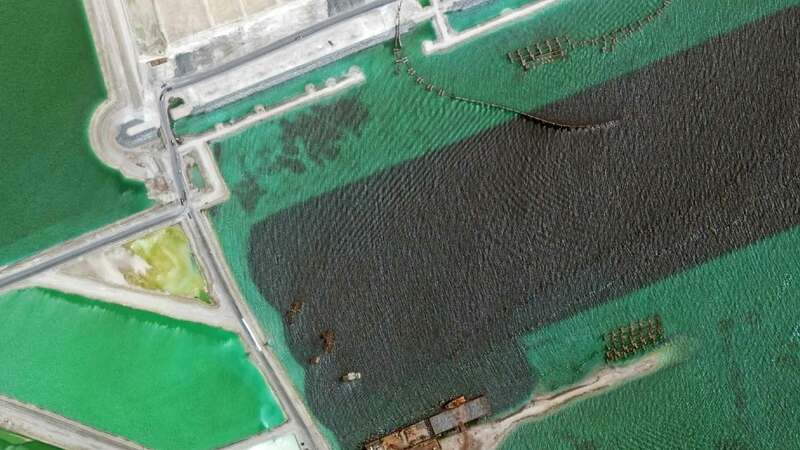 Very high resolution satellite imagery of the New Port Project shows how the site developed between August 2012 and May 2014. Collecting eight bands of multispectral imagery at 0.5-meter spatial resolution, the DigitalGlobe WorldView-2 satellite was considered ideal for tracking the precise movement of earth materials with an accuracy of less than a meter. Most importantly, the satellite is able to image nearly any point on earth on a regular basis without the restrictions that apply to aircraft. Each month, GeoID requested European Space Imaging to task WorldView-2 to acquire images over the site and deliver Ortho Ready data products to its Belgian processing facility. GeoID orthorectified, mosaicked and color-balanced the scenes for use by MEDCO. The client was using engineering design software instead of GIS to view the imagery, and GeoID recommended processing strategies that would result in file sizes compatible with the software’s limited memory capabilities. After some experimentation, the Belgian firm resampled the image data to create separate mosaics each month at two- and four-meter pixel resolution. The GeoID technicians divided the mosaic into easy-to-load quarter segments. Environmental concerns mandated relocation of sea grasses, corals and mangroves in the project area. Additional mangrove plantations adjoining the site remained untouched but were monitored for change. Early in the project, vegetative stress was reported in the nearby mangrove plantation. 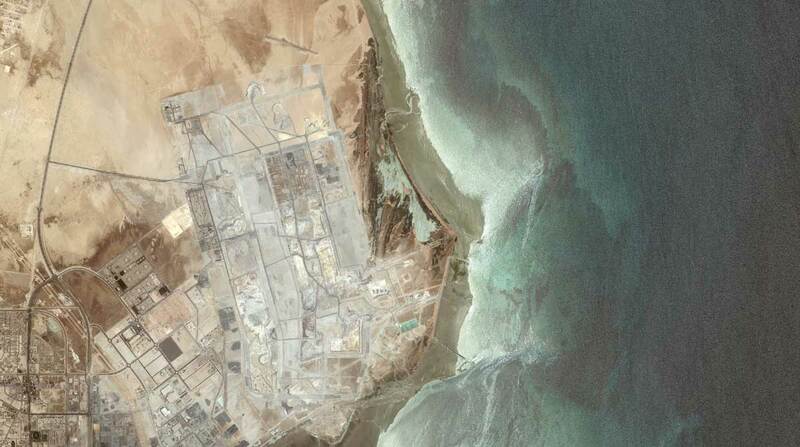 GeoID requested archived satellite imagery acquired over the NPP site before actual development began in 2010. The Belgian firm processed the false-color infrared data from the multispectral WorldView-2 imagery to detect early signs of stress in the mangroves that would have been invisible to the naked eye at the time. Technicians also created a Normalized Differential Vegetation Index (NDVI) from the raw data to classify the mangrove by condition. The results therefore identified that dredging activities were not responsible for the mangrove damage and were in line with the rigorous environmental guidelines set out for the project. The imagery clearly showed the mangrove stress had begun before the port project even started. Create a viable and practical solution to monitor the progress and environmental impact of a rapidly evolving construction project covering more than 500 km² of land and sea area. European Space Imaging partner GeoID processed and delivered WorldView-2 satellite imagery from in sub-sampled mosaics covering the entire project area with resolution sufficient to track movement of sand, equipment and vessels over time. The client cost-effectively confirmed work reported by subcontractors aligned with progress shown in the satellite imagery. In addition, the client proved to be in line with the strict environmental guidelines by using archived false-color imagery to show vegetation degradation preceded construction. Belgium-based GeoID, a WorldView Global Alliance authorized reseller, specializes in visualization of landscapes using a variety of spatial data from satellites, UAVs and other sources that it processes and enhances in house. GeoID is also a developer of virtual landscape modeling software.